You should go up the stairs for your bags. *Appreciate it your kindly understanding. it's so easy to go there! It's stylish and fully private space just for you! Peace of mind to be comfortable on your journey! 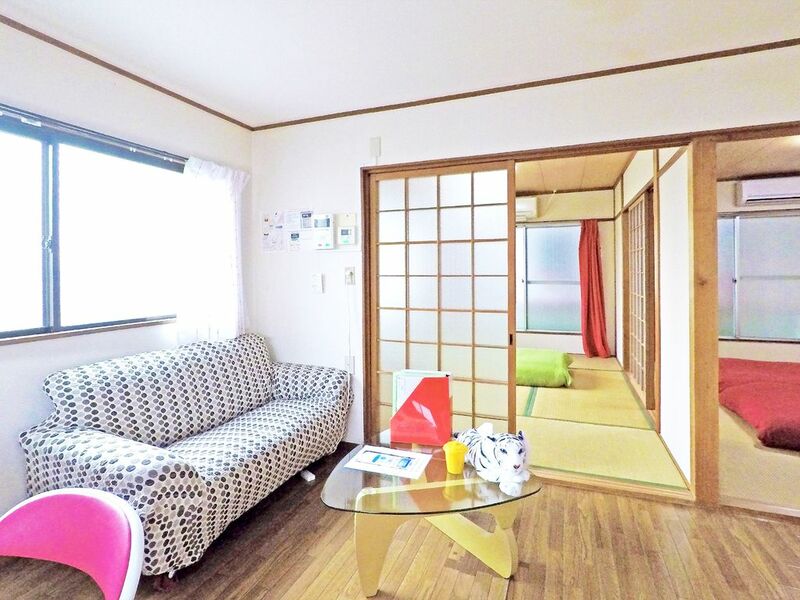 Youll definitely feel at home and relaxed after the noisy crowds of downtown Osaka! Newly renovated, clean, and cozy and private apartment. Quite, safe residential area with many restaurants and shops. Both JR and Metro stations less than 5 min. walk from apartment. air-conditioner, refrigerator, microwave oven, etc. Free portable Wi-Fi to keep you connected outside the apartment! Please feel free to contact us if you want to early check-in or late check-in and something. We give my guests space but am available when needed. We can provide you some information in the local area. We will offer the real Cool Osaka-style life! That's why it's my local area. If Im free and or available, I can show you around, also we can get together. If you want pretty sure I can tell you some good local places. Maybe you cant find it in the guide books. Please feel free to asking if you need any help during your stay. We will do our utmost for your memory in Osaka, Japan to be delightful and unforgettable. Hope to be your help in order to make your trip in Japan be comfortable the accommodation for you. We will value the interaction with you. The "Friendship OMOTENASHI N 5 Styles"
That's why our (N 5 SQUAD) office in same building. Please feel free to come into N 5 SQUAD office if you want! If you need any help and some questions and feel free to asking to us in our office. We (N 5 SQUAD) will offer the real Cool Japan-style life(Osaka-style)! We just want to be of your help! We want to be your help in order to make your trip in Japan be comfortable the accommodation for you. and something others you need. And also Pretty sure We can help you if you want A, B, C.
If you want we can tell you some good places. Its a very local place, not many people know about it. Maybe you cant find it in some guide books. No other, " THE ONLY N 5 SQUAD STYLE!" if you want please feel free to ask me anything regarding your interests and desires that you wanna try during stay, if you like! Very close to subway but is outside of main tourist area in a quiet neighborhood. I like it because it allows experience living with locals and away from the hustle/bustle. Place is comfortable but not luxury. Have kitchenette with refrigerator and microwave. If you are a light sleeper, the noise from train may bother you. Host very nice and accommodating. When get out of subway, head away from park toward direction with railway overpass. location is parallel to the railway. Excellent host, comfortable place to stay and great location! I arrived late in the night and he accommodated me with no problems. He explained how to use everything in depth, he had a ton of useful books full of places to go and places to eat in the local area and all over Osaka. There was always a quick response to any questions I had or if I needed help with something. If I go back go Osaka I wouldn't hesitate to stay here again. Thanks for everything Hossy! Hossy's home is very good! If you travel to Osaka you have to live in Hossy's house! 다른건 얘기 할 거 없이 만점 이구요. 이 친구에게 정말 놀란건 저희가 유니버셜 티켓을 미리 구매하지 않아서 곤란했는데 도와주려고 로손 편의점까지 가서 자판기로 몇십분동안 시도하고.. 또 안돼서 결국엔 인터넷 구매까지 도와줘서 아주 편하게 놀다 왔습니다. 호시 아니였으면 가족들이 크게 실망할뻔 했네요. 너무 착한 호시형 이였습니다. We had a great time and stay in Osaka. Hossy is a very nice and helpful host! He gave us helpful directions and recommendations to Osaka. Thanks for your kind Mr.Hossy.